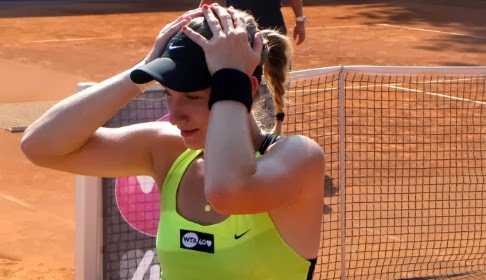 Austrian Wild Card Lisa-Maria Moser withdrew today from Linz main draw, leaving space for a last minute entry of German Angelique Kerber, world n°9. Nothing strange, one might think, such changes happen very often, especially at the end of the season. But this time the situation is very different and this last minute change looks far more complicated and not as clear as it should be. The young Austrian had her breakthrough earlier this summer, when in another WTA International in Bad Gastein reached the Quarter Finals by defeating en route world number 30 and top seed German Mona Barthel. Ever since her ranking kept rising, but as the cut off for Linz was out, it still wasn't enough to make it to the Qualifying draw. Once Petra Kvitova withdrew from the entry list, because of her deep run in Beijing, the Austrian federation gave a WC to Moser, who moved to Linz and no longer than yesterday was drawn to face Swiss Stephanie Voegele in the first round. Overnight something happened though, it's not very clear when exactly, but the team of German Angelique Kerber requested a WC for the tournament, as the withdrawal of Kvitova left a spot for another top 10 in the draw -we shall remind that International events are allowed to have only one top tenner. This WC appeared as very needed for Kerber, who needs to score as many points possible in the next weeks, as she's fighting with Jelena Jankovic and Caroline Wozniacki for a spot in the year ending Master, soon happening in Istanbul. Apparently the request of WC for the German came too late as the draw was already out, but then, unexpectedly, this morning Lisa-Maria handed in her request of withdrawal from the singles maindraw for "personal reasons" and immediately afterwards she appeared on the entry list for doubles partnering with another Austrian WC, Nicole Rottmann. At this point it won't surprise anyone to find out that her WC went straight to the German and all the seeding of the draw changed. Another interesting detail about this unusual situation is added by the fact that rules allow the players who finished the previous year within the top 10 to play only two international events and Kerber this year played Monterrey and Washington already. A quibble though gave Kerber another shot to an additional international event, because Washington was played during the same week of Carlsbad, a premier tournament that Kerber couldn't play because it had reached the limit of top 10 players allowed there. This situation, according to the rules of WTA, allows the "damaged" player to enter an additional international event and so Kerber had her right to get it. Nonetheless, it still seems questionable that a player -like Moser this time- can be "suggested" to withdraw and let another player compete on her place simply because of a bigger fame and better ranking.